Just Us Girls Color Challenge! 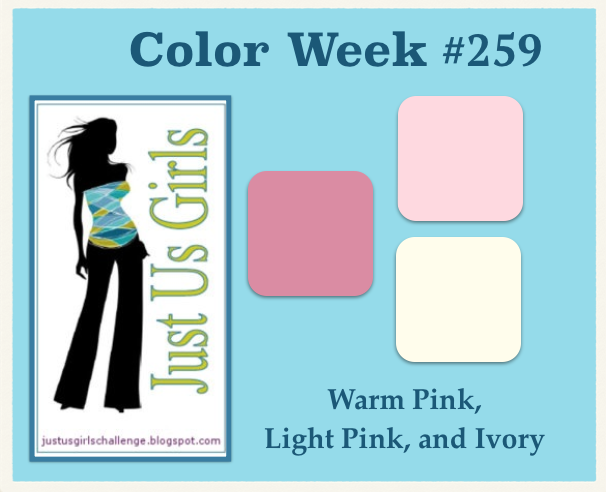 Hello friends, It is my week to be hosting over at Just Us Girls and it’s color week and I have one of my all time favorite color combos for you! Shades of Pink and Ivory! When I was younger I was definitely not a pink kind of girl, but that all changed after my 30’s I would say! Now anytime I have on a pink shirt everyone says it’s ” My Color.” Anyways, Hope you come on over and Join Us at JUGS this week and see what the Design Team and our GD Bobby has done with these colors! Here are a few card details: All of the card stock, paper, and stamps are from Stampin UP. I embossed that beautiful flower from the set Blooming with Kindness with gold embossing powder along with the sentiment which is from Express Yourself. I used 4 different shapes of nestabilities. I sponged over the embossed flower with SU Blushing Bride ink. The ribbon and Stylish Stripes embossing folder is also from Stampin Up. Two of the 3 flowers and the labels are made with SU punches. The 21 is some great gold stickers I found that matched perfectly! Any other questions….just let me know! This card came out rather nice, but I am still working with the camera so the photo doesn’t quite do it justice! Hope you have a wonderful weekend and find sometime to be creative and play along with me! Who knows….if you are chosen as the Chic of the week…you can possibly be selected to be a future Guest Designer with us too! 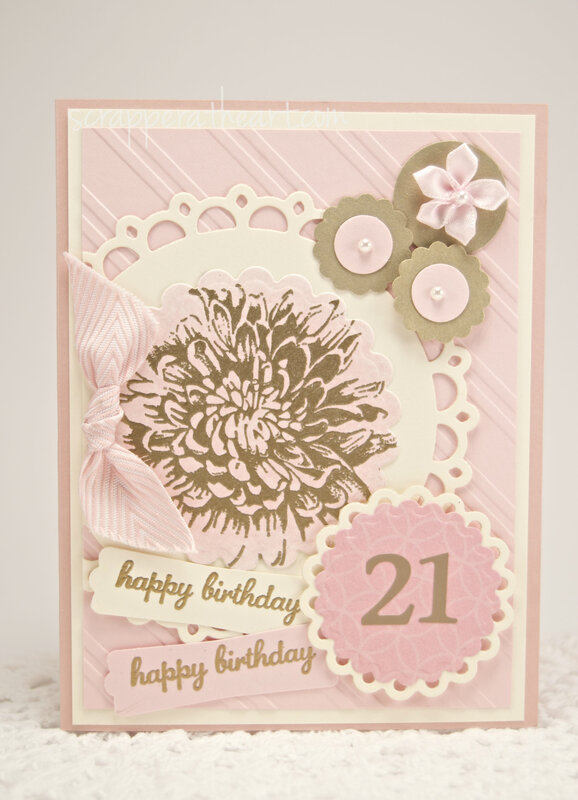 Categories: Cards | Tags: Card making, Cards, embossing, Happy Birthday, rubber stamps, stamping, Stamping Up | Permalink. You put a lot of different elements into your card, Nancy, and they look wonderful together. This is so pretty. Love the circle elements. Great choice for the color challenge. That big flower image is BEAUTIFUL and I LOVE your doilies! FAB colors this wek! Beautiful! Those are awesome colors together too! Nance- green is my fav color, but people always say pink is my color too. Love your card! Beautiful card, Nancy! I love this color combo and your pretty gold flower. Nice accents to make this card even more beautiful! Nancy, this is totally gorgeous! That big gold embossed flower is so pretty and I love all of the shapes and the texture. Great choice for the colors this week.